Beautiful Japanese ginbari cloisonne vase. At 9 1/2", this is an unusually large and desirable example among the same group. It probably dates from the Meiji period (1868-1912) when the art of Japanese cloisonné enamels reached its highest point. Technological improvements enabled artists to create wonderful examples, including one of the most desirable techniques called "ginbari" (silver foil foundation) shippo as you see it here. In this vase, the impressed silver foil ground accentuates the two beautiful flowering chrysanthemum branches. 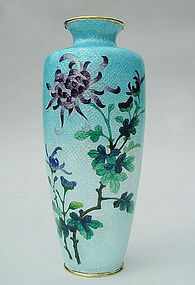 The flowers are highlighted in various shades of purple, blue, and green enamels and the background shows a gradual transition of the colors; turquoise at the top to clear enamel towards the bottom of the vase. The brass rims on this vase were finished with the old technique; a sheet was sodered and hand applied with another piece (see photo #4). Both fittings still show remains of a gold wash which indicates that this quality piece was made with exceptional care. Padded wood box with a wooden stand. Condition: Overall good condition with the exception of some hairlines on the shoulder and neck portion. There are lines around the neck area where the silver foils were folded following the small neckline from the body of the vase. It is difficult to find small cracks (a couple of them) in this neck area. They almost do not appear to impact the enamel surface and cannot be felt when touched. This type of damage is most likely caused by the drastic temperature changes when the ginbari cloisonné was taken out of the kiln or even later years; unfortunate but expected.